Studio Nihon: Experience Japanese culture through food, sake, and fine arts. About Fukiko. Studio Nihon is a catering and events company that offers a range of custom services in Japanese food and arts. We will bring the unique flavor of Japan to your personal or business entertainment, with on-site Japanese food catering, a sushi-making or sake-tasting party, calligraphy lessons, or a Japanese cooking class. Studio Nihon is committed to being eco-friendly. We offer delicious, healthy Japanese food using the seasonal, organic, and local ingredients wherever possible. A variety of menus for vegetarians are available. Curious about our name? In Japanese, Japan is "Nihon," written with the characters 日本. These characters represent the meanings "sun" and "origin" respectively. Now you know why we call Japan the Land of the Rising Sun! 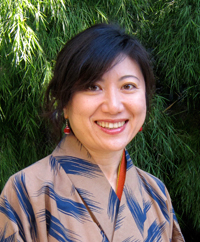 Santa Barbara resident Fukiko Miyazaki is the owner of Studio Nihon. She has been sharing her enthusiasm for Japanese food, sake, and culture with U.S. friends and clients since she moved to California in 2005. Ms. Miyazaki received her earliest cooking training at her mother's side in Takamatsu, Japan, where she grew up. After 15 years working as a busy marketing researcher in Tokyo, she returned to her first passion, cooking. In Santa Barbara, she attended the School of Culinary Arts at Santa Barbara City College. She holds a Personal Chef Training Skills Competency award, and has worked as a sushi chef at Ahi Sushi in Santa Barbara. In 2009, Ms. Miyazaki completed a sake training program in Japan that qualified her to become the first certified Sake Sommelier between LA and San Francisco. Teaching has been an important part of Ms. Miyazaki's career. She has taught Japanese calligraphy at Santa Barbara City College for years, and more recently has enjoyed teaching sushi-making to students at both SBCC and UC Santa Barbara. Copyright © 2009 Studio Nihon. All rights reserved.